​In Greek mythology, Hecabe was queen of the city of Troy, and wife of King Priam. Primarily famous for her children, Hecabe would become more prominent in events shortly after the sacking of Troy. ​In the ancient texts there is little agreement about the parentage of Hecabe. Three potential fathers of Hecabe are given, Dymas, a king of Phyrgia, Cisseus, king of Thrace, and Sangarius, a Potamoi. If Dymas is the father of Hecabe, then Hecabe had two brothers Asius and Meges, whilst if Cisseus is the father, then Hecabe had a sister in the form of Theano, who became wife of Antenor. ​Hecabe would become the second wife of King Priam, after Arisbe, and would become mother to a number of children to the King of Troy. The number of children that Hecabe gave birth to varies between sources, with some writers putting forth a number of 19 children, although a more common number is 14. There are generally ten sons of Hecabe named, these being Hector, Paris, Deiphobus, Helenus, Polites, Antiphus, Pammon, Hipponous, Polydorus and Troilus. Potentially, Troilus is not a son of Priam and Hecabe, but was instead fathered by the god Apollo. Four daughters of Hecabe are also given; Cassandra, Laodice, Polyxena, and Creusa. King Priam himself may have fathered as many as 68 sons, and a further 18 daughters. 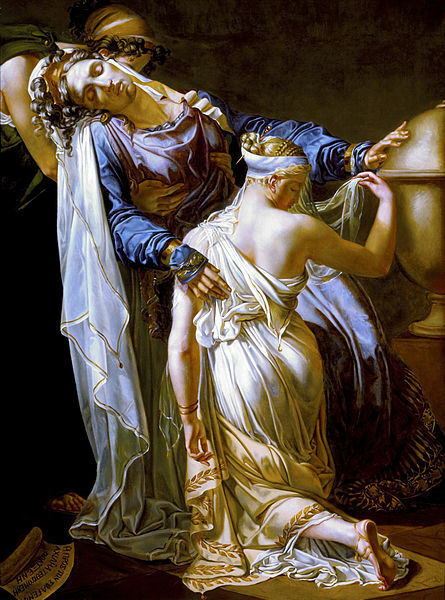 Hecabe comes to the fore in regards to events in the Trojan War, although she is only a peripheral figure in the Iliad by Homer, where Hecabe is displayed as a dutiful wife and mother, offering advice to Priam and to Hector. In the timeline of the Trojan War, Hecabe is of course essential in the story of Paris’ birth. Whilst pregnant, Hecabe would have a dream whereby the Queen of Troy gave birth to a burning torch, which subsequently wandered through the city of Troy, causing the city to burn. Aesacus, the stepson of Hecabe, born to Priam’s first wife Arisbe, was called upon to interpret the dream, for he was a highly skilled seer. Aesacus would state that the son Hecabe was about to give birth to would be the cause of the destruction of Troy, and so this son must be exposed upon birth. Paris was of course the son born to Hecabe, and whilst he was left upon Mount Ida, but did not die, and was then raised as a herdsman. Paris of course eventually returned to Troy, and took up position in the royal court as a son of Priam and Hecabe. After the arrival of the Achaean forces at Troy, Hecabe would witness the death of most of her children, her grandchildren, and her husband during the ten years of fighting and the sacking of Troy. Cassandra – becomes concubine of Agamemnon, and killed upon arrival in Mycenae. Priam himself was killed by Neoptolemus, having strapped on his old armour for one last battle, despite the pleadings of Hecabe to seek sanctuary in one of Troy’s temples. ​Hecabe herself would survive the sacking of Troy, by which time only Helenus, who had previously departed from Troy, Polyxena, Cassandra, and potentially Laodice, were still alive. Hecabe, like Cassandra, Andromache and other women of Troy would become prisoners of the Achaean forces, and Hecabe was given to Odysseus as his share of the spoils of war. There was still more heartache for Hecabe though, for she would witness the sacrifice of her youngest daughter Polyxena, upon the tomb of Achilles. For it was said that her sacrifice was called for by the ghost of Achilles, and that her death might give the Achaean fleet fair winds home, just as the sacrifice of Agamemnon’s daughter, Iphigenia, was said to have brought fair winds to Troy. ​It was said that on the same day as the sacrifice of Polyxena, the body of Polydorus, the youngest son of Hecabe, washed up upon the beach near to the Achaean camp. Hecabe and Priam had sent their youngest son to Thrace to ensure his survival, with care of Polydorus given to King Polymestor. It was said though, that Polymestor had killed Polydorus when he heard that Troy had falled, possibly to gain friendship from the Achaeans and possibly to gain the Trojan treasure that had accompanied Polydorus to Thrace. ​Hecabe sent a message to Polymestor asking the king to come to Troy, with the promise of revealing where the rest of the Trojan treasure was hidden; Hecabe of course not revealing that she knew Polymestor had killed her son. Agamemnon knew full well what Hecabe was doing, and provided a clear route for her messenger, Agamemnon being in a convivial mood, for Hecabe’s daughter Cassandra, was now the Mycenaean king’s concubine. Thus Polymestor came to Troy and now, perceived as an Achaean ally, entered Hecabe’s tent, there Polymestor and his two sons were in the midst of a number of Trojan women, and suspecting no trap, Polymestor let his guard down. Then, the women drew daggers, and killed the two sons of Polymestor, and whilst the king of Thrace was held down, Hecabe stabbed out his eyes. Agamemnon though refused to punish Hecabe for her, and the other Trojan women’s actions, for he saw it a just punishment for the murder of Polydorus, who had been taken in for safekeeping. Various stories are told about the end of Hecabe, but commonly it was told that as Hecabe, as a slave of Odysseus, sailed from Troy, the former queen of Troy leapt from the ship into the sea, believing death was better than slavery. Alternatively, Hecabe was perhaps transformed into a dog by the gods, for when attacked by the Thracians, seeking revenge for the mutilation of Polymestor, she snarled at them as if she were a dog. 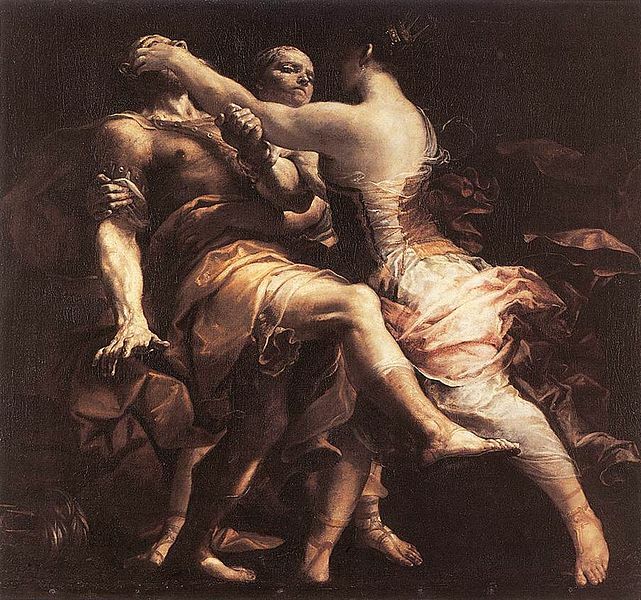 Or else the transformation of Hecabe occurred when she snarled and cursed Odysseus and the other Achaeans.